Free Speech issue again [Googlish Finnish translate]. - News agency Kavkaz Center's ideology is sick, the terrorist ideology. It is immoral and damaging the reputation of Finland. Kavkaz Center's players are Satan's messengers. It claims the vicar of the North Juha Molari eyewitness program warriors of freedom of speech. 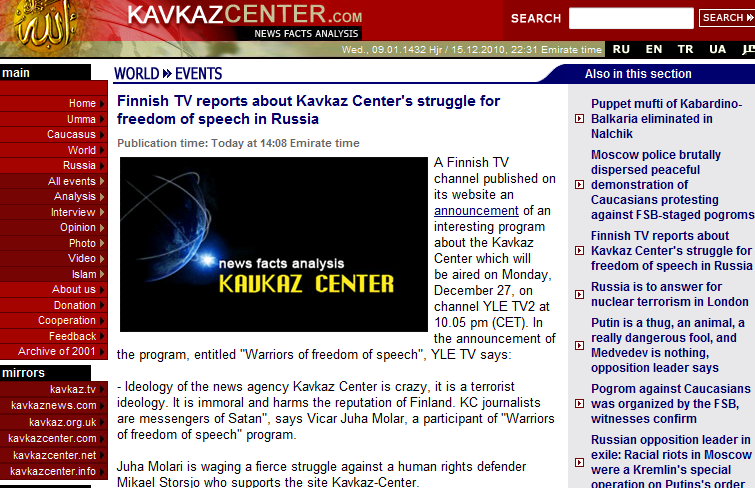 Journalist Juha-controlled stage of the ear seems to Eyewitness Molarin and civic activist Mikael Storsj�n between the merciless struggle, which is maalitauluna website Kavkaz Center. Mikael Storsj�n office in downtown Helsinki is one of the sites from servers. Molarin view Storsj� supports terrorists, defending the Kavkaz Center's activities. Storsj�n believes that the issue is merely a free speech battle. - North Caucasus is a state of war, where men are outnumbered forests. My job is to ensure that their voice is also accessible to the public, defends Michael Storsj�. I'm not a Jew, but I'm honored to be called a Zionist by the likes of the Kavkaz Center, the notorious propaganda arm of the "Islamic Emirate of the Caucuses". You know, the same people who brought you the Beslan massacre. It's laughable that the group would cite "free speech" as their justification for publishing their objectively pro-terrorism website. Even more deplorable are the "human rights activists" who are defending the mass murderers and Islamofascists.